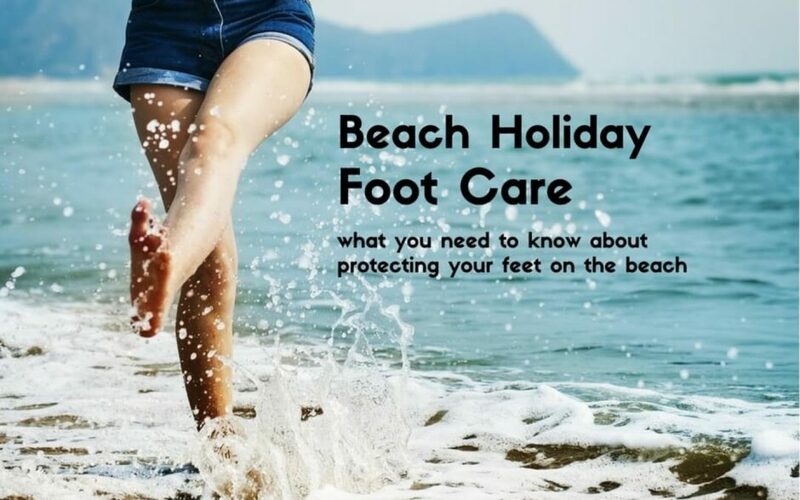 Sun, sea and sand are key ingredients for an enjoyable summer holiday – but unfortunately they can also be a recipe for disaster for your feet. Even the most beautiful beaches can harbour foot-health hazards. Whether you’re heading to a beach in the UK or abroad, it’s important to understand the dangers and how to protect your feet from them. With that in mind, we’ve created a foot health guide to help ensure that your feet are ‘beach-proof’! When you see a strip of golden sand stretching out in front of you, it’s tempting to rush barefoot onto the beach. Holidaymakers often forget that sand can be red-hot. Bare feet are easily burned, causing pain, redness and blistering, so keep your sandals on at least until you’ve checked the sand’s temperature. Of course, it’s not only sand than can burn your feet; the sun’s rays can be just as harmful. However, according to a survey by skincare brand Nivea, 29% of sun seekers neglect to rub sun cream into their toes, while 46% leave the tops of their feet unprotected and 57% their soles. Don’t forget about your feet at the beach or fall into the trap of assuming that sandals will protect them from sunburn. Feet need sunscreen and shade, just like the rest of the body. If you’re looking forward to volleyball, football or jogging, you’ll need to wear supportive sports shoes at the beach, ideally trainers. Sand is so soft and uneven that without proper support, you may experience foot and ankle pain or injuries. In addition, existing problems, such as plantar fasciitis, could be exacerbated. Even if your only exercise will be strolling along the shore, it’s a good idea to ditch your flip-flops in favour of substantial sandals with arch, ball, heel and ankle support. To maximise your footwear’s supportiveness, use tailor-made orthotic inserts. If you’ve taken your shoes off, gently remove all traces of sand from your feet with a towel before putting them back on again. You should also make sure that there isn’t any sand hiding inside the shoes. Grains of sand trapped between your feet and footwear will rub against your skin, which is not only uncomfortable but can also lead to sores and blisters. When you’re paddling in the sea, it’s hard to spot dangers lurking by your feet. Sharp stones, bottle tops, glass shards and coral can easily pierce – or get stuck in – skin. Sturdy water shoes, designed to prevent cuts and grazes, are invaluable. Take a first-aid kit to the beach just in case, though, so you can look after any wounds if necessary. If you have broken skin on your feet, avoid paddling and swimming. Seawater can contain dangerous bacteria, which could easily enter your body causing serious infections. Keep a safe distance from sea creatures that may sting. Weever fish spines, for example, can get lodged in your feet and cause considerable pain, as well as many other unpleasant symptoms. The NHS emphasises that sea creature stings require urgent medical assistance from a lifeguard (or someone else with first-aid training) or, in severe cases, paramedics. Are you planning a beach holiday or suffering from a beach-related foot ailment? If so, you can depend on our London podiatrists for expert foot care and treatment. We can carefully examine your feet, resolve problems and give you tailored foot health advice. For beach holiday foot care from foot health specialists, please call Feet By Pody today on 0207 099 6657 or book an appointment online.